I always love finding dresses like this from back in the day. Many women wore these at home on a daily basis, and didn’t worry too much if they had to run out for an errand – a little freshening-up: a combing and touch of hairspray, powder & lipstick and off they went to the supermarket. Other women, who worked in the garment unions, made these dresses in large quantities. Most of them found their way to the rubbish bin after being worn for years of cooking and housecleaning, but a few of them made it out alive. Love the lines of the slightly older style on the right. So, here we have two of those gals who were well looked-after and might have lived a more leisurely life. They were half-sizes (plus) in their time but now would be lucky to qualify as large size. However, their styles are forgiving and may serve me very well just as they did their first owners. Fun! This dress is SO Fifties. Ric-rac was a big deal on casual clothing and day dresses. Classic style, classic tailoring and classic fabric. A “Renee Original”. Very feminine, very versatile. I photographed it on Madge and it fits her “VA – VOOM” like a Fifties sweater-girl but I think I’d like to see it on more petite Stella, instead. This little blouse is a fine sweater-knit. Looks great with pants or skirts. Although it doesn’t show well in the photo, the small collar is decorated with delicate applique and beads. I haven’t tried it yet with the ’40’s slacks shown yesterday but the color is close so it might be perfect! What a fabulous find. This blouse is a cross between sportswear and dress-wear. In the Forties, daily outfits were usually more finely tailored and sophisticated than what is worn now, no matter how “cute”. 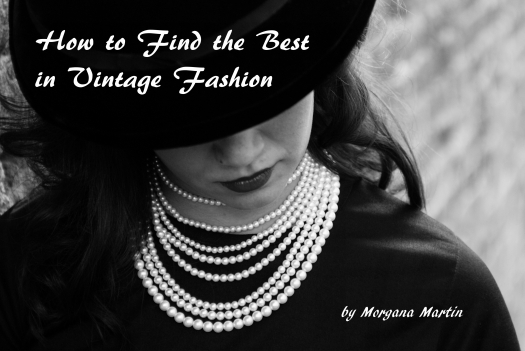 If you really want to be well-dressed, take a lesson from true vintage fashion . . . . . . . . . .. ..